Having an interesting dilemma that I cannot seem to come up with a working solution to. I have a text box that we need people to enter a time into. I dont want it to be a mask but rather onBlur the string "completes" with the proper format. 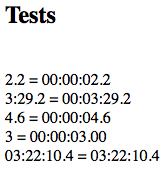 For example, the user enters 3:29.2 for their time, onBlur the result needs to be 00:03:29.20. Or the user enters 4.6, onblur should result in 00:00:04.60. Just curious if you could point me in the right direction or come up with a demo, I think this would be very useful to many folks as a blog entry. Can you guess why that failed?